Estimating cubic yards of concrete for your next project is now easy using our Concrete Volume Calculator. 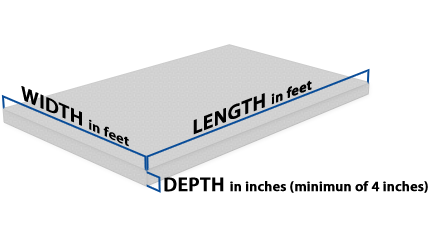 We provide this easy-to-use tool to allow customers to estimate concrete required for a Slab, a wall and a Caisson. Simply enter in the measurements and click the CALCULATE button. Enter the length (in feet), width (in feet), and depth (in inches) of the slab, and click “calculate” to determine the amount of cubic yards required. 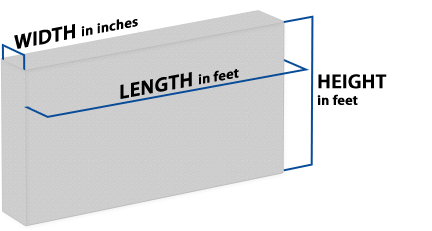 Enter the length (in feet), height (in feet), and width (in inches) of the wall, and click “calculate” to determine the amount of cubic yards required. Enter the diameter (in inches) and the total length (in feet) of the caisson, and click “calculate” to determine the amount of cubic yards required. DISCLAIMER: This concrete calculator is intended to provide an estimate only. Job site conditions and concrete mixes vary. Benevento provides this tool as an estimate only and cannot guarantee accuracy, which is subject to user data entry, job site conditions and concrete mixes. If you require more assistance or have questions, please contact our Sales Department.